When I graduated high school my parents moved from Nashville to Houston, literally dropping me off at college on their way. I remember it being a really confusing time in my life, trying to figure out the newness of college and being on my own, and not really knowing where “home” was. At one point in time I had a Tennessee driver’s license, Texas license plates, a Nashville area code phone number (still reppin’ the 615, actually), and an Arkansas P.O. Box… it was a very confusing time to be filling out any sort of paper work. I was all over the place. Fast forward four years, and I’m in a somewhat similar season of my life. I’m two and a half weeks from getting married, three and a half weeks from moving in with Noland’s parents for a month, and about seven or eight weeks from us moving to Texas. I have a new car that needs permanent tags in the next couple of weeks, which I suppose will be Arkansas tags. Its title is in my not-yet-existing married name, and my current and soon-to-be maiden name is on my Texas drivers license. And, I really don’t understand who’s insurance actually covers me right now (though everyone keeps telling me it’s fine), so I certainly hope there are no accidents during this season of limbo. Long story short, I’m not really sure where I live or who I belong to right now. I’m somewhere between leaving my parents care and not quite yet being in Noland’s. My room in my house full of familiarity is slowly being put away in boxes and sent to storage, while I prepare to basically live out of a suitcase for my first month of being Sara Gilmore. Since graduation I haven’t had classes and newspaper editing to keep my mind off of all this change, so you can imagine I’ve been spending a lot of time just wondering about the unknown that lies ahead. Guilty of being in a season that’s “about me,” not always remembering that my God is bigger than my fears of the unknown, insecurity has crept in at times. It’s funny how focusing on ourselves is how we end up losing ourselves the most. So yesterday, I was continuing to try and pack up/compartmentalize my life into things that can go ahead and go to Texas and things that I need for the rest of the summer, when I stumbled upon a box of letters. I think I found every piece of mail I ever received while I was in college. Post cards, birthday cards, and “just because” cards, that my mom apparently sent way more than I remember her sending during my freshman year. I laughed a lot going through all of it. There were two letters, though, that I sat in a puddle of tears as I read through. 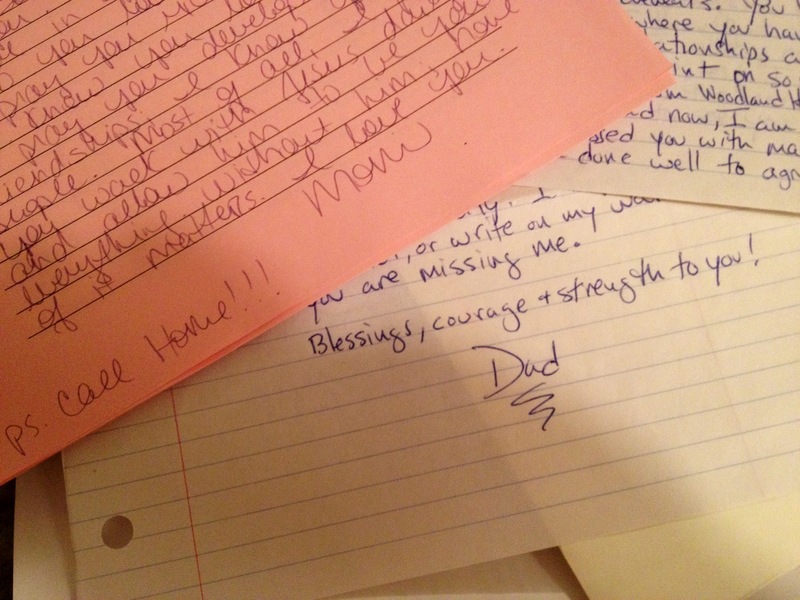 They were letters my parents wrote me when I left for college. The first one from my mom, I remember finding the day after she left Nashville. She moved a week before me and my Dad to get most of our stuff moved to Texas, and we stayed back until it was time for me to go to school. She told me in her letter that life as we know it was changing, but no matter what I would always be her “Lou” and she would always be Mom. She said she would miss having me around all the time … that she would miss my big blue eyes and my captivating smile, and that she would miss my sense of humor. She told me she was praying for me as I went off to college… that I would thrive in my academics, because she knew I loved to learn; that I would excel in soccer, because she knew I loved competition; and that I would develop great friendships, because she knew I loved people. Then I read my dad’s letter. I remember the day it came in the mail about a week after I started classes that fall, and I remember exactly where I stood in my dorm room in University Hall as I read it. He told me that the smoke had finally settled from the change in our family’s life that summer, and it was finally hitting him that I was away on a new journey. He gave me his blessing to take whatever risks necessary to “live out my story.” He said it will come with heartache and struggle, but that all great achievements are seasoned with great drama. He told me he was excited for me, because he knew how I loved adventure and challenge. And he told me he was proud of me, and that ever since I was a little girl he knew I was destined for greatness. The sweetest thing about those letters was one word that they shared: know. My parents could have said “I think you’re ______.” But instead they told me what they knew about me. Mom was praying specifically for me, because she knew what I loved the most about life — learning, competing, and loving people. Dad gave me permission to “go for it” in figuring out who I am and what my life will look like on my own, because he knew I loved adventures and challenges. He encouraged me because he knew I was going to do something great one day. When I worry about how I will do in all of this transition… growing up, becoming a wife, being a part of a church plant… it gets overwhelming, because I can’t do any of those things well on my own. It will only by the grace of God that I succeed in all of those things. But He reminded me yesterday that He lives in me. He knows where I’ve been and He’s been there the whole time. He knows where I’m going next, too. So as Noland and I prepare to be married and become a team forever, we just talked last night about how our biggest prayer for one another is that we would have less of ourselves and more of Him. Because just like my parents wrote in their letters to me, God knows what we love the most, he knows who we are, and he wants us to know that even though life as we know it is changing, He will always be Dad. He wants us to know that we have His blessing to take risks and figure it all out, because He knows we love adventure and challenge, and He knows we’re made for something great. He knows it because He made us. And as long as we’re focused on Him and not us, we’ll see the greatness He has created us and brought us together for come to fruition… though there will, as my dad said, be some struggle and heartache along the way.